We were heading into Nevada specifically to go to Reno and paddle the Truckee Whitewater park. It was taking us 12 hours out of our way but the pictures looked amazing and the write-ups all said that water flowed year round… It was an interesting geographical change from Utah, as we drove into the Great Basin area with large expanses of flat desert landscape. Surprise #1 was a pacific storm rolling in on the day we were leaving St. George. 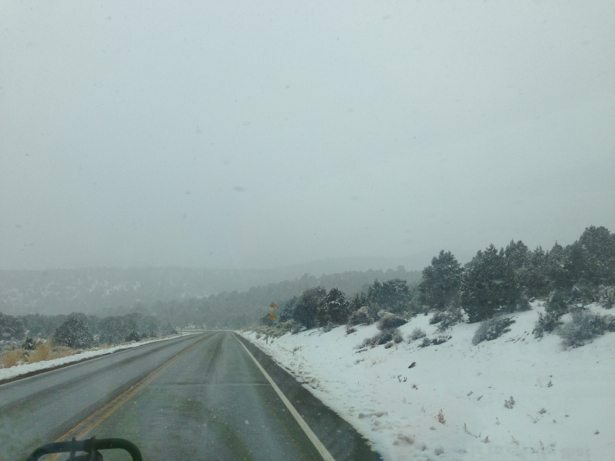 It was bringing high winds, low temperatures and precipitation to Northern California, all of Nevada and parts of Utah. Oh GREAT… We’ve done this once already in September in B.C. – should we start to anticipate this on a monthly basis??? Surprise #2 was learning that Nevada is the most mountainous state in the United States and that means when you are driving east to west (or west to east), all you do is cross summits! This makes for long driving and alot of work for the truck (aka poor Fordo). More to come on Great Basin National Park & Lehman Caves (where we camped at 7300 feet and were surrounded by snow) and our exceptionally quick visit to Reno.